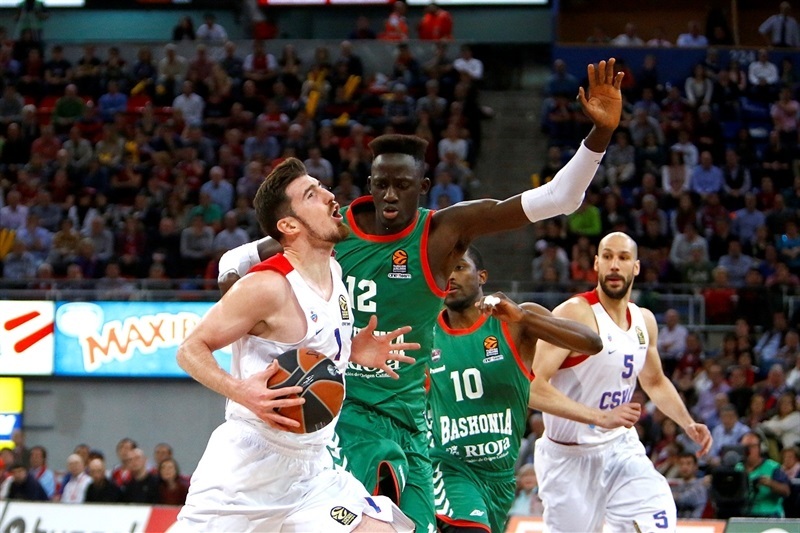 CSKA Moscow advanced to the Turkish Airlines EuroLeague Final Four by downing Baskonia Vitoria Gasteiz 88-90 in a thrilling Game 3 in their best-of-five series on the road on Tuesday. 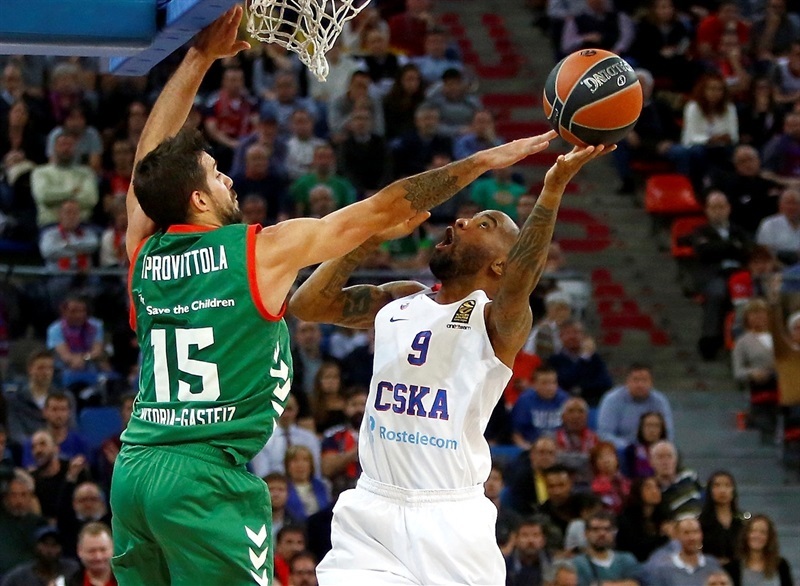 CSKA swept the series, advanced to the Final Four for the 14th time in 15 years and has the chance not only to win its eighth EuroLeague title, but to successfully defend its crown for the first time in club history. 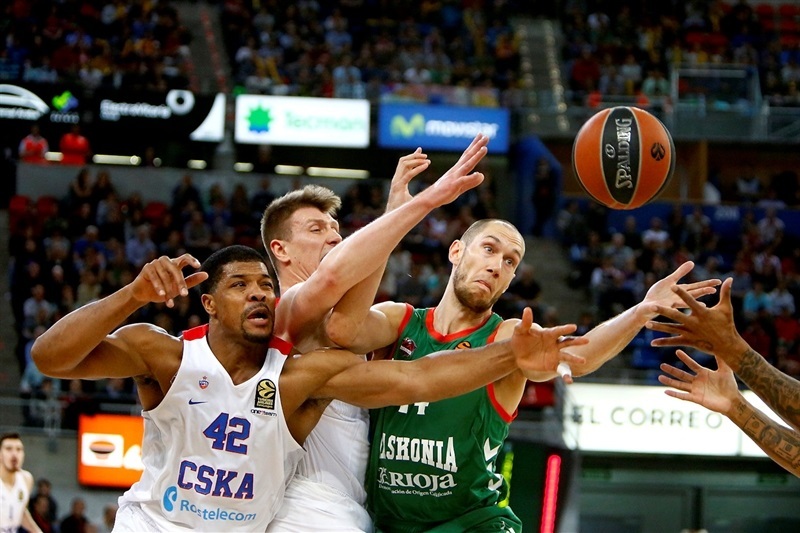 Baskonia had a bitter end to an otherwise fantastic EuroLeague season. Cory Higgins led the winners with 21 points, Nando De Colo added 15, Milos Teodosic scored 13 and Aaron Jackson got 10 for CSKA. 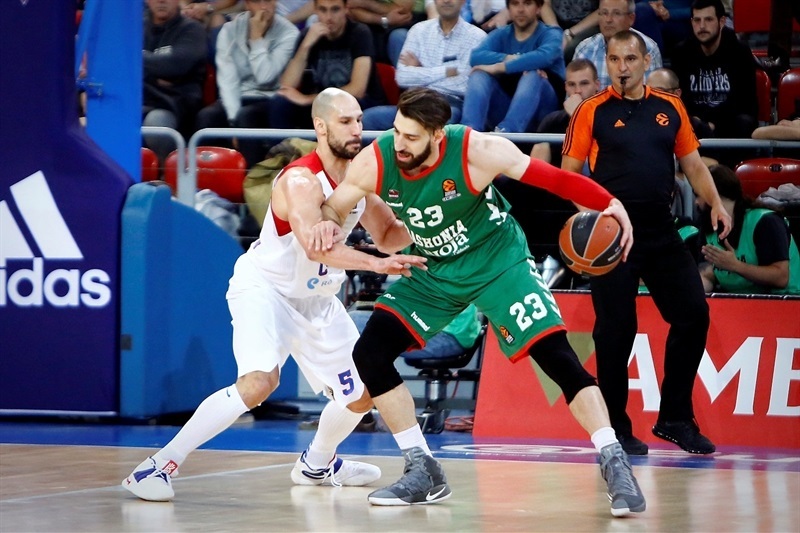 Toko Shengelia led Baskonia with 19 points, Chase Budinger added 15, Adam Hanga and Shane Larkin each scored 13 and Jaka Blazic got 10 for the hosts. 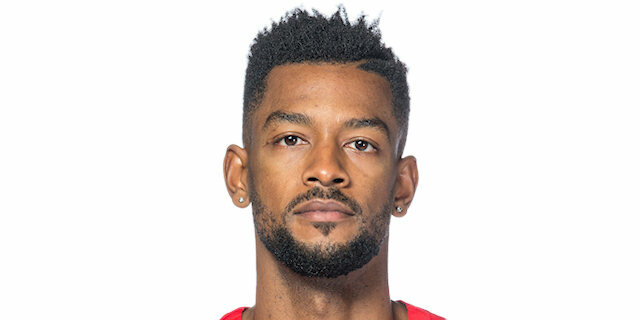 The game came down to a final possession for Baskonia with a shot to tie – or win – the game, but Kyle Hines's rejection on Hanga at the buzzer sealed the outcome. Nikita Kurbanov followed free throws with a three-pointer to give CSKA an early 2-5 lead. 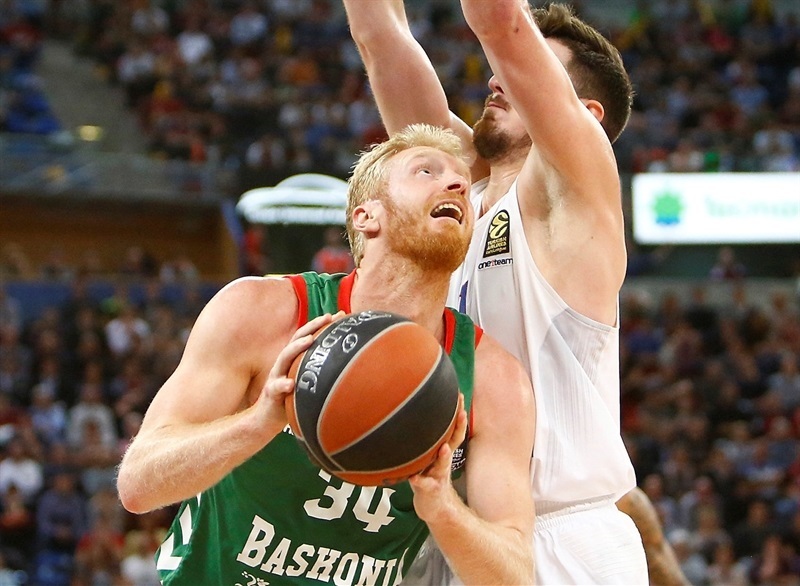 Baskonia found a go-to guy in Budinger, who had 5 points in a 7-0 run that gave the hosts their first lead, 9-7. 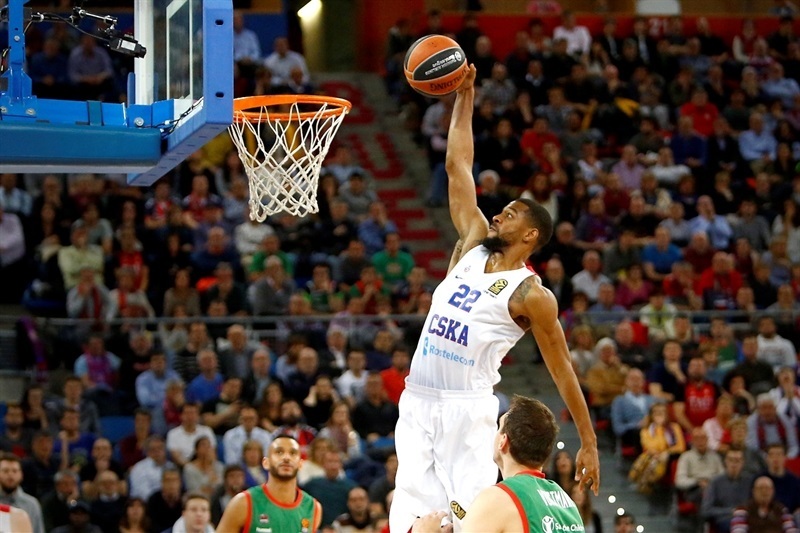 Hines stepped up for CSKA, but Budinger and Ilimane Diop kept Baskonia ahead, 15-14. Nicolas Laprovittola struck from downtown, Blazic added a couple of basket and an alley-oop layup by Rodrigue Beaubois gave the hosts a 24-20 lead, which Higgins cut to 24-22 with a buzzer-beating jumper right at the end of the first quarter. A three-pointer by Blazic and a fast break slam by Hanga made it 29-22 early in the second quarter. Higgins had 7 points – including a dunk in traffic and a triple – in an 1-12 run that De Colo capped with a bomb from downtown for a 30-34 CSKA edge. Johannes Voigtmann rescued Baskonia with a three and a put-back layup and an unstoppable Budinger brought the hosts within 39-40. 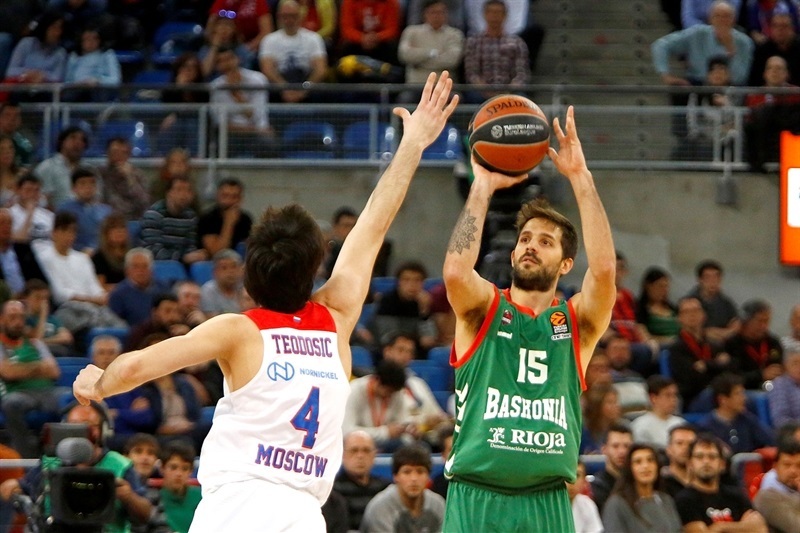 A jumper by Budinger and a triple by Hanga put Baskonia back ahead, 44-43, at halftime. James Augustine and Andrey Vorontsevich took over after the break and a jumper by Higgins gave CSKA a 46-49 lead. Shengelia followed a three-pointer with a dunk and soon struck again from beyond the arc to tie the game at 55-55. 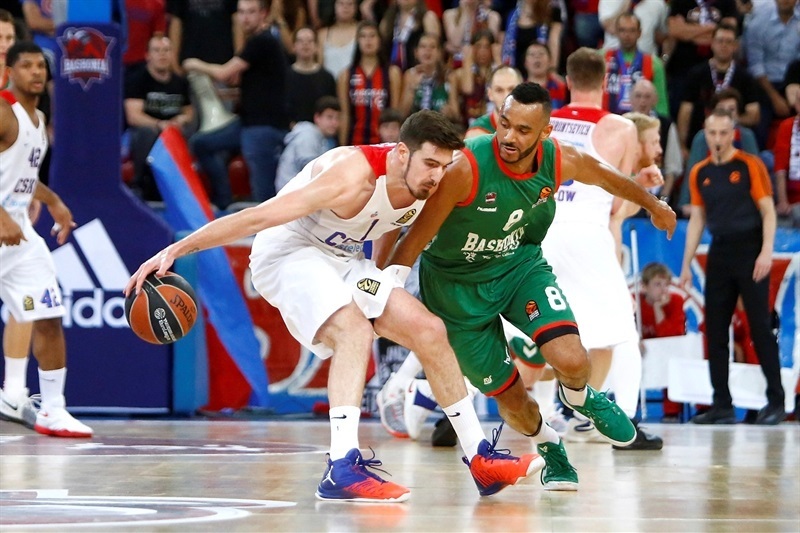 Shengelia kept pacing Baskonia, but a layup-plus-foul by De Colo and three-pointers by Vorontsevich and Victor Khryapa boosted CSKA's lead to 63-68. Shengelia and Voigtmann helped Baskonia tie the game at 70-70, but a close basket by Teodosic fixed the score at 70-72 after 30 minutes. 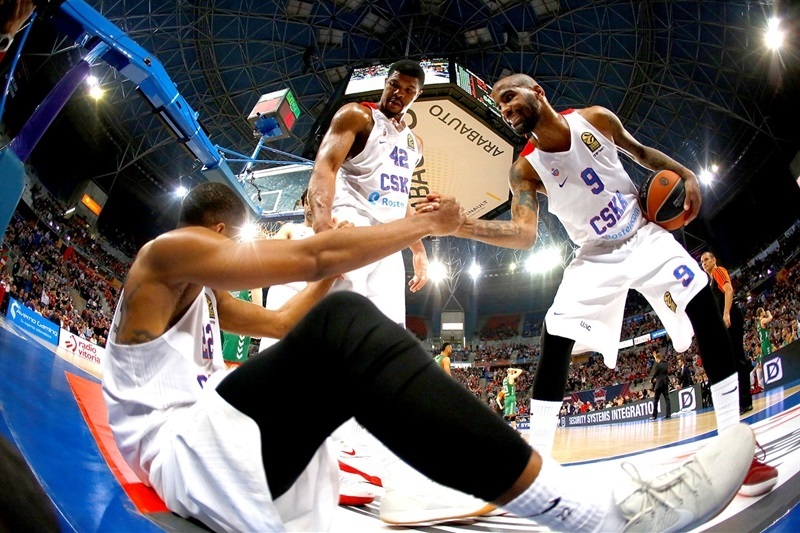 Blazic scored down low early in the fourth quarter, but Hines and De Colo gave CSKA a 72-76 lead with six minutes left. Jackson hit a three-pointer and followed Hines's turnaround jumper with an acrobatic layup that made it 74-84 with over three minutes to go. 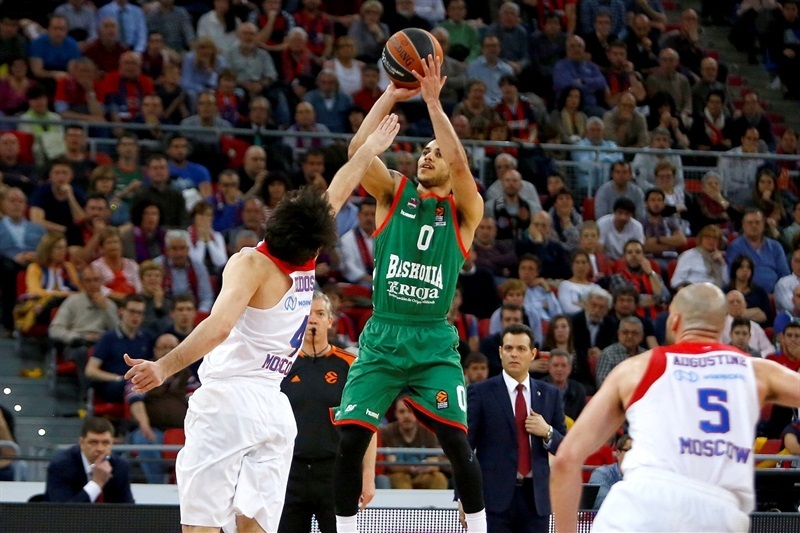 Shane Larkin singlehandedly brought Baskonia within 87-90 with 37.2 seconds left. After Higgins missed, Larkin split free throws and Baskonia got the ball back with 6.3 seconds to go. 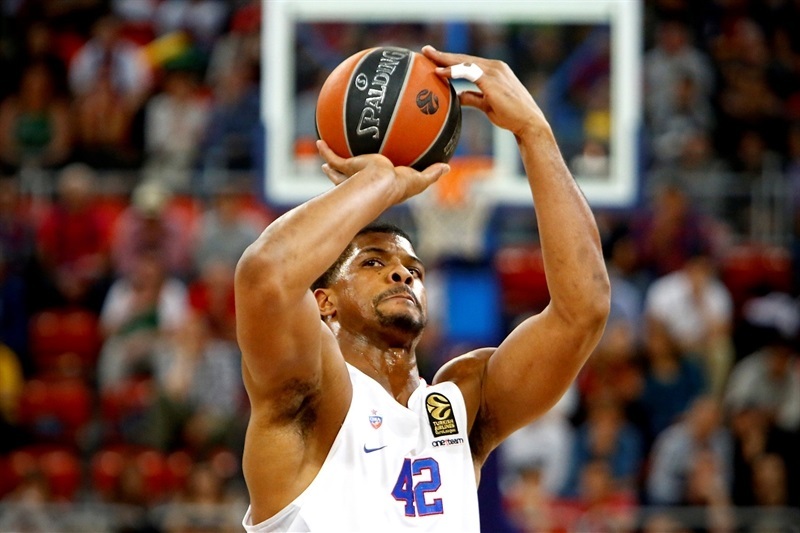 Larkin missed from downtown and Hines blocked Hanga's shot to send CSKA... to the Final Four! "First of all, congratulations to our fans. Without them, it was would have been impossible to compete. I appreciate the effort they made to come to the gym and believe in our team. Without them, all of the things we have done during this game would have been impossible. I want to tell them that we will improve and want to fight all the way in the Spanish League to make them proud and happy with our job, all the way. The EuroLeague finishes now and we now must focus on the Spanish League, but thanks again to our fans for their support. When you have the chance to win a game, it means you did something good to get to that point. I want analyze our road in the EuroLeague this season, in which I think we did incredible things, but lacked a little bit of determination to finish fourth or third in the regular season after doing such great things. This is what we have to improve in the next stage of the season - the Spanish League. Being mature enough and ambitious to get the best result possible. If the maximum is finishing first, we must try and fight for the maximum goals. Once we qualified and ranked fourth in the EuroLeague Regular Season, we had to fight to avoid such a big team as CSKA, the biggest squad in Europe, made to beat any team. 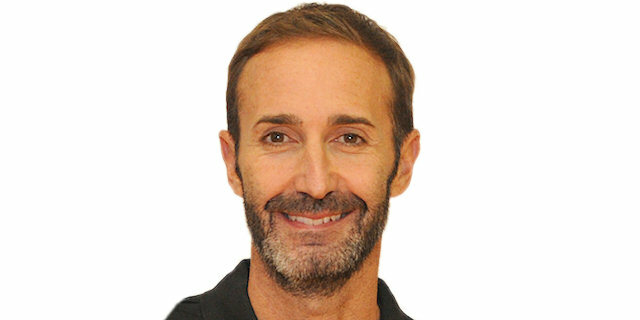 We can do great things together, but the most important thing is improving what depends on us, and it is something we are taking to our next goal, the Spanish League. I think we deserved better than 3-0 and my job is to analyze why we didn't get a win against team we had on the ropes several times." "Big congratulations to my team and to my players again. They deserve a big applause. We had some really injured players for the first time in this series. I am going to say that Teodosic is playing with injections, without practicing almost at all, with a big pain in the foot. We also had other players with several injuries and wanted to help the team. They wanted to show and make a big statement that we are here. We go back-to-back in the Final Four, but this is just a ticket to the Final Four. We want something more and do deserve right now to celebrate the qualification, especially with 3-0 against a great team. Baskonia had a great season and as I said to their coach, he did a great job over here. They have a great atmosphere, great fans and played really good, modern basketball. Let's not forget that Baskonia made it to the Final Four last year, played overtime to go to the final and the legacy they had all these years is big. A big congratulations to Baskonia, I wish them the very best. It is an honor to play against such a team and great players. I have only the very best to say about Baskonia. Coming back, and last, but not least, I will repeat what I said in the beginning, that the congratulations go to my players. Like we said before the game, they had the character, the wish and the desire to go over there and defend the title, to be a part of history. Big congratulations to CSKA. It is the 14th Final Four for CSKA in 15 years and my third consecutive with the club. We did control the end of the game… mostly. 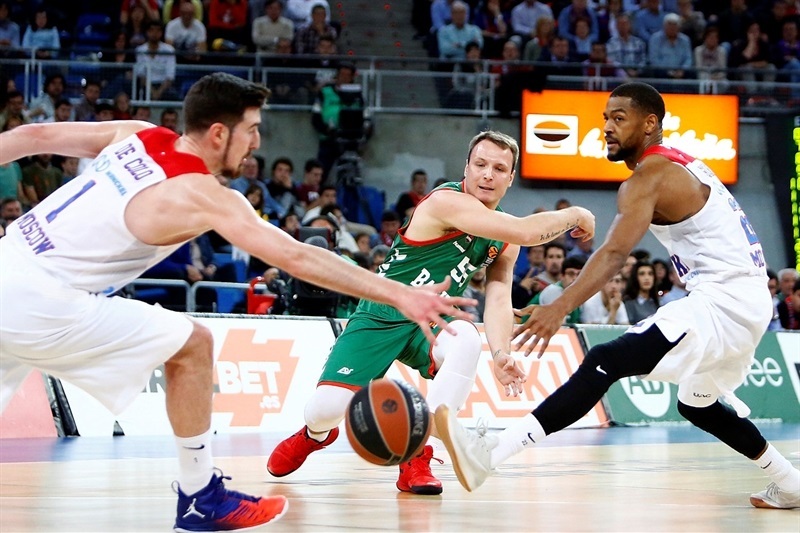 It is obvious that Baskonia recovered, like they did in all three games, other than in Game 1, when they led 88-90 with two minutes left, in Moscow. We had a 10-0 run and won Game 1. In Game 2, we had the lead and may divide the game in two: the first three quarters and the fourth quarter. The first three quarters, we were dominant and then they come back hitting big shots, tying the game in the clutch moments, but we took the win. Today, we had something different. We were over there all the time, both teams. Towards the end, in the clutch moments, we took a good lead of plus-9 and could have handled it differently." "It feels great. It was one of our goals, one of our stepping stones for the season, so it is great to reach it. Our work is not done, but we accomplished one of our big goals. It has been incredibly tough. They didn't stop fighting until the end and every game came down to the wire. We knew it was going to be a fight with them, but stuck together and came out with the W."